Naltar: Air Chief Mujahid Anwar Khan Monday distributed prizes among the winners of international ski competitions held at Pakistan Air Force Ski Resort Naltar, Gilgit Baltistan. 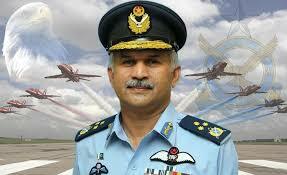 The Air Chief urged the international players to take the positive and real picture of Pakistan to their countries. In the slalom and giant slalom categories of the ski races, TSIBELENKO Levko of Ukraine won a gold, and three silver medals while his fellow countrymen NARIICHYN Andriy won a gold and three bronze medals. In the giant slalom categories, the gold medals were won by Turkish skiers. Pakistan’s Muhammad Kareem got one gold and one silver medal in the men`s category. In the women`s category, Ukraine’s Tetyana Tikun achieved three gold and one silver while her fellow countrymen Anastasia Gorbunova got one gold and three silver medals. Pakistani skier Amama Wali won three bronze medals and Jia Ali got one bronze medal in slalom category.